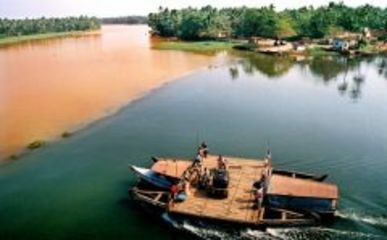 Eloor is a river island on the river Periyar around 17 kms from its mouth at the Arabian Sea near the city of Cochin, the commercial capital of Kerala. It occupies an area of 11.21 square kilometers . A 450-acre industrial area was established in 1962 and falls under the Kadungalloor panchayat. Two years later, the displaced families were rehabilitated to Thandirickal colony, near the Edayattu Chal (canal), which had been the most-preferred waste dumping yard of the companies over the years . Eloor supports the largest industrial belt in Kerala with over 247 chemical industries. The industries make a range of chemicals- petrochemical products, pesticides, rare-earth elements, rubber processing chemicals, fertilizers, zinc/chrome products and leather products. Most of these industries are over 50 years old and employ the most polluting of technologies. The industries take in large amounts of fresh-water from the River Periyar and in-turn discharge concentrated effluent with nominal treatment. This leads to the large-scale devastation of aquatic life in the river and the farmlands in the region. There are more than 30 effluent pipes spewing toxins into the river directly from the industry. Air emissions range from acid mist to sulphur dioxide, Hydrogen Sulphide, Ammonia and Chlorine gas . Organo Fertilisers, a bone processing factory, and ‘Cee Jee Lubricants’ are located the canal. A joint survey conducted by the PCB and the Ward 17 Welfare Association identified 13 companies, including the Organo and Cee Jee, as heavy polluters  Major industrial units in the area include Fertilizers and Chemicals Travancore Limited (FACT), Hindustan Insecticides Limited (HIL), Indian Rare Earths Limited (IRE), Merchem Limited etc . There are close to 40,000 people living and working on the island, 29,064 of whom are part of the village community not employed by the industries. There is a high direct and indirect dependence on industries of a lot of people in Eloor . Study has shown that vegetables, fruits and poultry grown on residents’ lands in the industrially polluted Eloor-Edayar area have high levels of pesticide and heavy metal residues that are harmful to human health .The people of Eloor and Edayar are under trauma as the deaths due to chronic diseases continue. The Kerala High Court had suggested that the construction of polluting industries should not be allowed in the Edayar industrial belt. The court made the suggestion on June 19 while considering a petition filed by Periyar Malineekarana Virudha Samithi . Project Details Eloor supports the largest industrial belt in Kerala with over 247 chemical industries. There are more than 30 effluent pipes spewing toxins into the river directly from the industry. Air emissions range from acid mist to sulphur dioxide, Hydrogen Sulphide, Ammonia and Chlorine gas . 2. Clean Production at Eloor should immediately be implemented. 3. Compensation and medically rehabilitation of pollution affected people. 5. Enforcement of the Environmental norms and laws. 6. The Companies and the Government must MAKE PUBLIC ALL INFORMATION regarding pollution, health risks, emergency preparedness and related dangers to local communities. Companies must ensure that all workers have access to their medical records. 7. Immediate punitive action need to be initiated by the Government on the companies that are poisoning the Communities and workers in the Industrial Estate and around. 8. The Companies must apologise to the affected people of Eloor and Cochin and accept complete responsibility and liability for their past actions. Why? Explain briefly. A Division Bench of the Kerala High Court in June 2012 suggested that no polluting and chemical industries be allowed to be constructed in the Edayar-Eloor areas and a permanent check dam be built to prevent pollution of drinking water sources in the Periyar. The Bench directed the State government to express its views on these proposals. The court felt that the government should not permit the starting of new chemical or polluting industries at any place east of Eloor-Edayar areas. The court was of the opinion that the government should not even allow any closed polluting industries to reopen. The Bench said that if a permanent check dam was constructed at Pathalam, it would prevent mixing of polluted water and salt water with the drinking water sources further east of Pathalam, although such construction would be expensive . [ 3]Thomas DR, Sunil B, Latha C. Physico- Chemical Analysis of Well Water at Eloor Industrial Area- Seasonal Study. Curr World Environ 2011:6;259-264.